Here’s a sweet deal for all the gamers out there. Asus has just launched a new gaming laptop in India, it comes with solid specifications which a gamer needs nowadays. Well, it is actually an ultra high-end specification featured laptop which is capable of running all the next generation games at 4K resolution. 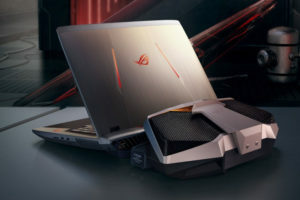 Here the specification details of the Asus ROG GX800 Liquid-Cooled Gaming Laptop. So, the Asus ROG GX800 Liquid Cooled Gaming laptop is powered by a quad-core 2.9GHz Intel Core i7-7820HK processor. Coming to the GPU aspect, it comes with dual GTX 1080 graphic cards and is paired with 64GB of Ram. And it has three 512GB PCIe SSDs. Talking about the screen size, GX800 comes with 18.4-inch LED backlit 4K screen and provides support for Nvidia’s G-sync which helps in delivering shutter free gameplay experience. This time, Asus has developed a special type of advanced mechanical keyboard. The keyboard comes with individually controllable RGB LED feature for every key. The company says that keyboard delivers a comfortable feel and smoothness for typing and gaming. The laptop comes with four speakers and has ESS Sabre DAC for gaming headsets. In connectivity options, there’s a Thunderbolt 3.0 and 10Gbps USB 3.1 for high-speed connectivity. Additionally, there are three standard sized USB ports, Gigabit Ethernet, and HDMI port. The main highlight of this laptop is its Hydro Overclocking dock which comes with dual liquid cooling radiators. Asus ROG GX800 Liquid-Cooled Gaming Laptop comes with a hefty price tag of Rs 7,97,000 in India.